This old fashioned fig dessert is simple, yet healthy for the whole family. 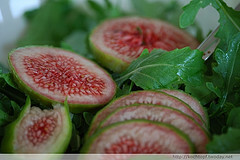 Simply wash & cut up some figs and serve them up with the delightful sauce for some warm, holiday cheer. This recipe makes an easy and nutritious dessert or treat to serve your family. They are a delight a holiday dinner parties, too! Simmer about orange juice, star anise (an oriental spice food) chopped ginger for about 20 minutes. Simmer until liquid volume is reduced and thickened. Strain the sauce and save only the liquid. Tip: Not reducing the liquid long enough may not give you the full flavor, so take your time.